Shall we get started? Why yes, yes we should. Image hosted on Tumblr. Week 1 will be devoted to learning more through the tutorials and learning how to navigate the toolset since the learning curve for the toolset for a beginner seems pretty steep. I am going to try to start with a small modding project to see how much I can do in a small amount of time and then try to see what kind of project is doable for the next three weeks by comparing with notes on forums. My main goal is to create a quest, so I need to piece together what is required in terms of the toolset to make a quest: characters, scripting, music, object-behavior(? ), and environment(s). 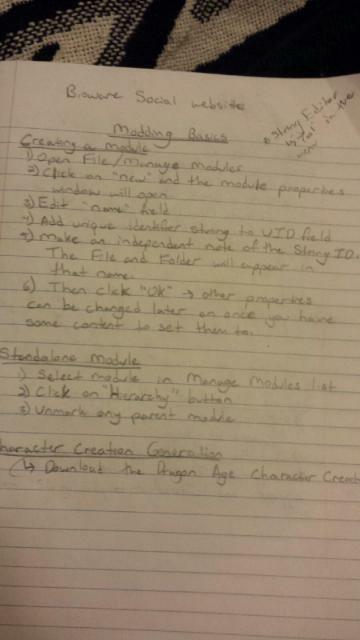 With a better idea of what I can initially do, Week 2 will start off with planning what my mod will look like by designing it on paper through small descriptions of what I want to do. If I find that my mod really does end up being a quest, I want to plan out the general quest, a character list, and the overarching story of what the quest is and why the player is undertaking this particular quest and whether or not it fits in with the official gameplay experience. As I make the mod, I will start seeing how the mod can work within Possible Worlds Theory as player creation being an extension of official gameplay, especially with such a strong collaborative community that modders have created as they share their mods and how they create those mods. The mods themselves become part of a player’s gameplay experience, changing certain moments in-game that give them a different perspective of the events they are working through, such as a romance option, a character skin (the physical look of a character), or a scene extension that is not official in Dragon Age Origins software. Week 3 will probably be the time period where I start rethinking how I approach my mod and the scope of the project as I adjust to match my (lack of) skillset. Hopefully, I will be making significant progress in shaping my mod towards a viable project, rather than a shamble of modding attempts in one environment. This week will be about learning how to integrate my creation into the official software and make it accessible to others. This may require diffing further into forums and tutorials, and scouring through YouTube for more user-friendly tutorials/demonstrations. There may be hair-pulling and rocking in a dark corner with my dogs looking on in concern. This too shall pass. Maybe. 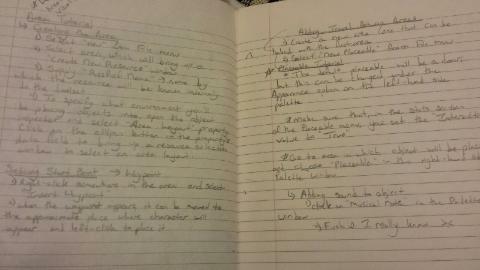 Week 4 should be the culmination of all of my attempts, with a cohesive body of work in terms of a mod. I should be working on finalizing a functioning mod and figuring out how to distribute/give access to my peers and professor. This will, hopefully, be the time when I look towards more difficult tutorials at how to extend the quest outwards for a longer project (such as a series of quests with an overarching narrative) and creating new characters who are fully voiced once the semester is over. Narratology theory books – most likely Possible Worlds Theory with my main book being Heterocosmica by Lubomir Dolezel. I already own a copy of Dragon Age Origins for the PC (I bought it through Amazon as a digital download), and the Dragon Age Origins toolset is available as a free download from the official Bioware Social Network site. Because Bioware is the one who distributes the toolset, I am not too sure if there are copyright issues, especially as the mods work within the software of the game. The only issue I may come across would be if I integrated someone else’s mod into my larger mod, but that is not my plan since I want to see what I can do with my own skills. My project is really two-fold in terms of what I need to do: 1) learn the software to be able to make a functional mod and 2) think through the kind of narrative theory I would like to work on in practical application when creating a mod. I have been looking at tutorials made by other modders and theory application is absent from their work as they are trying to fill in gaps they found in the game and extra applications/looks they think would enhance their gameplay and the gameplay of others (such as outfits, weapons, and avatar skins to be more inclusive). What I will need to do before truly diving into the project is to settle on a narrative theory that intrigues me enough to see how it would operate in a gamespace, most especially in a user-modified gamespace, and I seem to be leaning towards using Lubomir Dolezel’s Possible Worlds Theory in his book Heterocosmica. Since my major goal is to make a playable quest for my peers, I may head in the direction of possible worlds theory as a way to see users’ creations as extensions of the actual game. Players are creating possible worlds based on their experiences within the game, creating other experiences that the game developers may not have had time for or something they may not have imagined themselves. My concerns for this project are centered around the learning curve with the toolset and learning how to make the components of a mod about a quest work together. The toolset looks deceptively simple in terms of the categories it presents to users, but it is harder to figure out what everything does and means because the system has been so simplified. The tutorials I have been crawling through are going to be my best bet for gaining the help I need and overcoming the problems that I have been facing/will be facing with the toolset. End of the semester stress? No comment. Image hosted on Becuo. Almost to the end of the semester. Image hosted on Becuo. 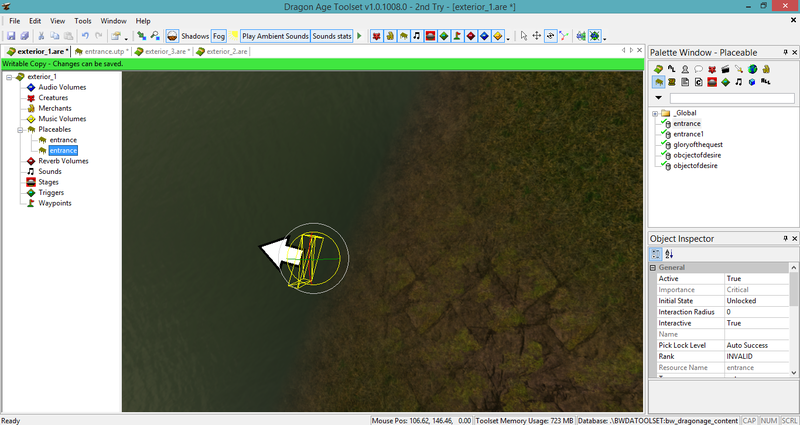 Ready for lovely modding tutorial annotations? Image hosted on the site PandaWhale. Hopefully, it will be like this. Image hosted on Reddit. This basic tutorial video about the Dragon Age Origins toolset was created by Fernando Melo, who is currently the Director of Online Development at Bioware (the company that designs the Dragon Age series, among others), with Ferret Baudoin, who was one of the lead writers for Dragon Age Origins and Dragon Age II, as a guest. The video is rather informative for a beginner as the speaker breaks down the basic elements offered in the toolset’s palette (it holds the “categories of assets” modders can access), starting with the areas (settings) for what will be crafted as the start location for the mod, especially since the speaker is so familiar with the technology and the game being explored. To give viewers a sense of what can be done with the software, he opens an “area layout,” which he uses to give viewers a guided tour of the 3D landscape of a layout that is used as a battleground for players in the early parts of the game. 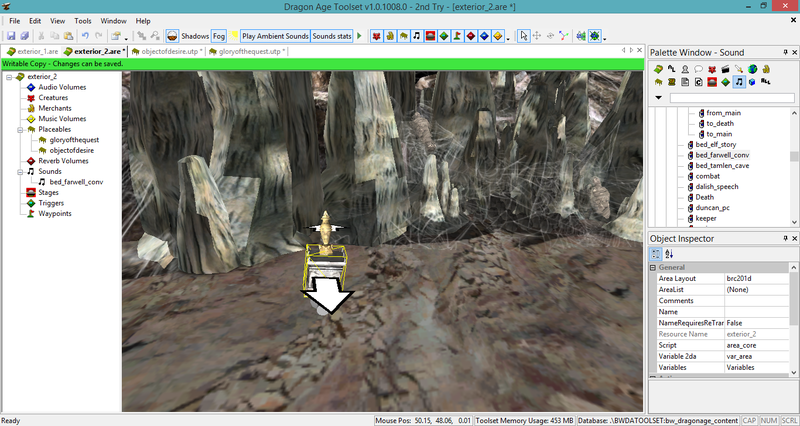 He takes the chance to introduce beginning modders to the implementation of scripting (which, according to Wikipedia, is “a scripted sequence is a pre-defined series of events that occurs when triggered by player location or actions that play out in the games engine”), though he mentions he will not be discussing how to script in detail until the toolset had been officially released to the public. The video has a definite weakness in that the screen being displayed is too distant to allow viewers to clearly see the menu items, so viewers must depend on the speaker to identify which selections he is making in the various menus. This is also a problem when the speaker talks about the variables of each item that are listed in the “Object Inspector” box. One other limitation of the video is that it was created before the official toolset was released (the creator mentions that they only have uploaded “what was needed to make the demo”), so the items in the toolset are very selective because the toolset had not yet been finished, but this limitation is easily resolved by locating tutorial videos released a little later. 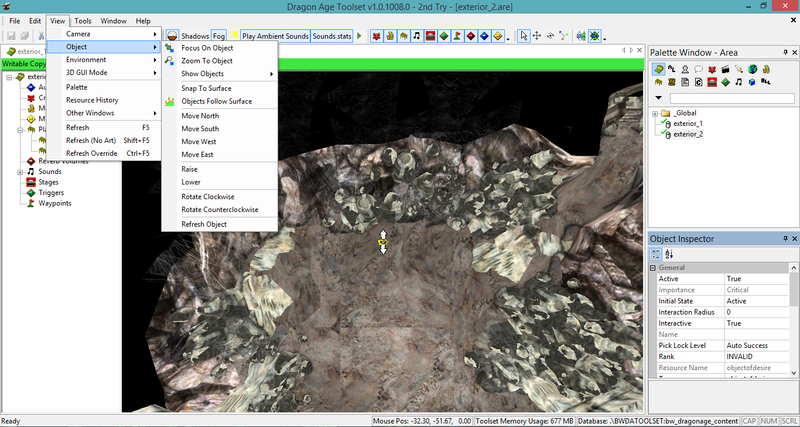 Out of the four sites I have listed here for my annotated bibliography entries, Nexus Mod’s section the Dragon Age Origins toolset is the most devoted to the products of the modding community, with the creators providing the files and instructions for other users to download and implement their mod into the actual gameplay. What struck me first as I explored the website was just how collaborative the community is, with members willing to share their hard work with others to make the game more enjoyable and customizable. As I begin learning how to use the toolset and to develop my own materials, this site will allow me to see what is possible in toolset through what other people are creating (as well as the limitations with what even experienced modders could not make or could not get to work). The site is split up a bit differently than other tutorial sites I have been looking at, as it has categories for “Files,” “Images,” “Videos,” “Forums,” and “Chat,” rather than direction categories for the types of mod creations. For my project, the Forum is going to be the place where I go the most on this site as it deals with more than just modding, going as broad as news about and technical support for the game series to spoilers about the game. There are even sections devoted to troubleshooting for building and modding, as well as requests for mods (which enhances the collaborative nature of the community as creators seek requests for what other players would want to see in the game as well as players asking for mods they would like to see created) and spaces for mod talk. For my project, the sections of troubleshooting for modding, mod talk, and the section for articles about Dragon Age mods are going to be the most useful as supplements to the official toolset wiki and various YouTube tutorial videos as it will be nice to read issues other users are having in comparison to my own difficulties navigating the toolset as well as see what can be done with mods (giving me a greater idea of the kind of scope I want for my project and the work it will take to make it happen). While the forums are created by other users, there seems to be very little trolling in the forums, as more experienced modders are very careful in breaking down explanations for new and other less experienced modders, which is not always the case for gaming communities. This resource is the official wiki set of tutorials for Bioware’s Dragon Age Origins toolset (the studio has other toolsets for games like Neverwinter Nights), and includes a link to the Dragon Age help site for users who experience issues the wiki site does not or cannot cover. Within the wiki, there are eight overarching categories: “Getting Started,” “Tutorials,” “Design,” “Art,” “Cinematography,” “Sound and music,” “Script,” and “3rd Party Extensions.” The Getting Started section was the first entry I read through as I started downloading and installing the toolet, skimming through the section on potential comparability issues since the toolset was designed for Windows XP and Windows 7 since I have Windows 8. This site was particularly helpful because I did have an installation issue, but it was with a program called Microsoft SQL 2005 (my computer could run, but made me jump through metaphorical hoops to download properly), which I found was a common issue for users. The tutorials section, which expect to spend a great deal of time perusing, is broken down into links to tutorials into beginner’s needs and moves out to larger tutorials with the promise that, “This set of tutorials forms a series, each building on or filling in omissions by the last.” The tutorials section does not just deal with how to create mods, but also how to export and implement those mods into the gameplay experience, and links out to other external sites with tutorials that I will most likely be scrawling through when I start to dig deeper into the toolset. This resource is going to be both very helpful and a little difficult to navigate, with each entry linking technical jargon to other pages, making it a web of linked pages that can be a bit overwhelming for a new user. The Dragon Age Origins Toolset Forum is a great resource for modders of different levels to post questions, betas to test, information about patches, and issues and potential solutions, among other threads. As someone who is both new to modding and new to the Dragon Age Origins toolset specifically, this may end up being the place for me to get started as I learn how to navigate the toolset and also act as a space where I could present questions and receive feedback about practical applications. The forum is broken down into seven broad categories: “General Discussion,” “Level and Area Creation,” “Cutscenes,” “Audio,” “Scripting,” “Project Announcements and Recruiting,” and “Custom Content.” One of the most interesting aspects of the collaborative community being fostered in forums are the “community contests,” particularly the ones hosted through a thread titled “The Toolset doesnt have to be hard! Noob-friendly video guides for the Community Contests.” In this thread for “Noobs,” the topics range from prop-making to level-making to head morphs, with links to video tutorials and lists of outside software needed for the side projects. The forum has ties to Bioware’s official toolset wiki, with users linking out to tutorials to read first before returning to the forum to ask more specific questions, but this relationship goes two ways as the official wiki pulls useful content from users’ posts to fill in tutorials. There are no major limitations to this resource, except for the amount of time it may take to wade through the thousands of threads and responses (the site has a search tool, but that is useful if I know exactly what I am looking for when I come to the site), but this is also a good thing because searching through the threads can lead to surprising and inspiring finds. **This is the first part with the second as a reflection on my wanderings through these support sites. For my New Media class, each of my peers and I are doing individual multimedia projects in which we are learning new technology and examining our own work through the theoretical frameworks we are learning in class (the ones I am writing about in this semester’s reading notes assignment). Anyways, this is my project proposal, so away we go! Pull the lever! Image hosted on Buzzfeed article. 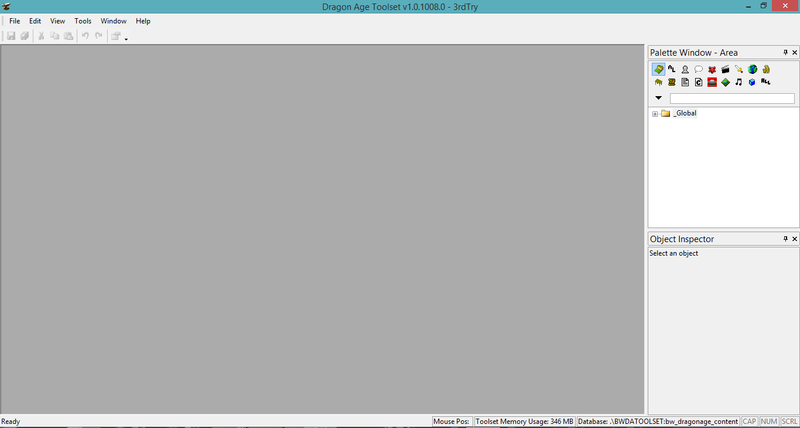 For this project, I am going to try to create a playable game mod for Dragon Age Origins. My intended audience for the development of this project is my professor and peers from ENGL 866: New Media. The majority of my peers are female (with one male in the group), and all of them are in the English and Creative Writing departments within the PhD, MA, and MFA programs at Old Dominion University. From what I know, some of my peers in this course are not gamers, while the others are gamers with varying degrees of familiarity, ranging from beginners to someone who is a hard-core gamer with experience in coding. This range from non-gamers to a hard-core gamer makes my project interesting because my end product should be accessible throughout the spectrum, being refined enough for a gamer to enjoy it as a text while a non-gamer can still maneuver through the gamespace and controls with relative ease. My secondary audience is anyone who stumbles across this blog and wants to follow the development process of this project (there are plenty of other steps coming soon to this blog, if you are one of those not-in-ENGL_866 readers). Unlike my knowledge of my peers’ experiences with gaming, I cannot assume to know other people reading my blog, so my project should be just as accessible to anyone taking the time to delve into my multimedia project. The tertiary (and final) audience would be other gamers who are familiar with and play the Dragon Age series, so the end product should be (hopefully) something gamers would want to add on to their own games. With my three levels of audience discussed, what is the purpose of this particular project? 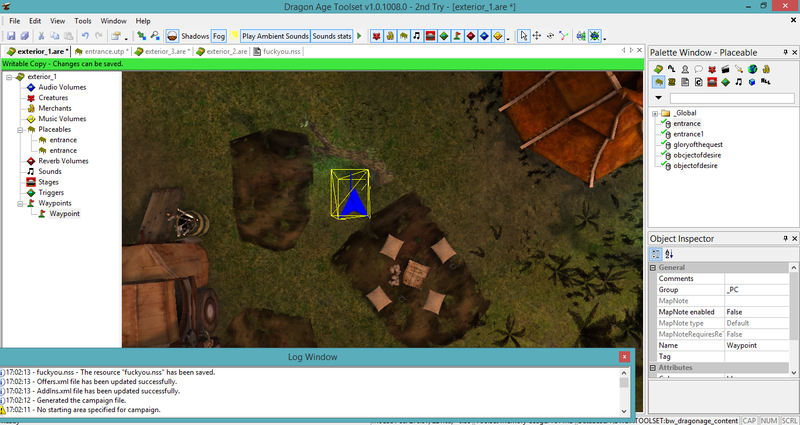 My aim in this project is two-fold: 1) to learn, for myself, how to create my own text (a mod) out of a preexisting text (the video game Dragon Age Origins) in order to better understand the tools of the industry, and 2) to create a mod that builds onto a theme from the game (coping with loss, the nature of self-sacrifice, what it takes to become a leader, how messy human politics can be, or the consequences of fanaticism. There are plenty of other themes to choose from, but these were the ones that interested me the most) to better understand how the building of a game mod can reveal the processes that underlie narrative creation and collaboration in a digital space. In regards to the first aim, the reason I am trying to familiarize myself with the Dragon Age Origins Toolset is because I would like to someday enter into the video game industry and Bioware is one of my favorite developers are they are able to intertwine engaging narratives and characters with fun game mechanics (from fighting styles to the dialogue wheel). Despite wanting to be the storywriter for a video game studio, a working knowledge of the tools being used to design the games would not only make me a better candidate, but would also give me a greater sense of what I could do to create a story players will enjoy and one that would actually be feasible for the designers/artists/programmers to create. On their website, in the Careers section, Bioware lists that for an Assistant Designer position, the candidate should have “Experience using world building toolsets (Unreal, Unity, Neverwinter Nights, etc)” as well as “Practical level building experience [and] Good scripting and commenting skills.” With this first aim, I am my own audience until I become familiar enough with the toolset to create game mods that I could potentially use as part of a job application, learning what works and what could work better after having played around with a mod design. With my second aim, which is more inclusive as to who is my audience, this purpose is also two-fold in that 1) I am attempting to show non-gamers what a game mod can do with narrative by building off of a preexisting text, and 2) to provide an experience for those who play Dragon Age that deepens their own interaction with the game itself. Game mods allow creators to manipulate the gamespace and character design to enhance gameplay by creating a new look for a character design (through things like facial features), adding to scenes, or by creating entirely new scenes, and many of these mods can be shared among players and added into each others’ gameplay experiences. In a sense, game modding creates a collaborative space for players, though the act of modding can be a solitary endeavor, in which they can engage with themes explored in the official games. I am choosing to work specifically with the Dragon Age Origins Toolset because the narrative in the game is so complex, the characters and their relationships with one another are intricately developed, and the game does not shy away from dealing with messy and harrowing themes. The game provides a great jumping off point for me to create a mod in which I present a new perspective to an in-game situation, or to use the tools/setting/character design that is already in place to create my own, related scenario. By presenting to my intended audience, a game mod of my own creation, I am hoping that we can start to see how the process of modding can change the way we see a delivery of narrative in the digital era and how digital tools are allowing us to reshape, share, and instruct one another in a collaborative space that is not bounded by physical space. **Update: As I work deeper into my project, my aim is to look at the ways in which narratology’s Possible Worlds Theory can be applied to modders’ creations, especially those that are shared in collaborative spaces and integrated into other gamers’ own gameplay experiences. I am choosing this theory, in connection with software studies and world building, as I am curious about how unofficial creations being added to official gameplay changes the shape of gamers’ narratives (especially as the dialogue wheel game mechanic allows players to direct their experiences within the gamespace, building relationships and reactions to events through choices they make). By potentially linking Possible Worlds Theory to software studies, I am hoping to uncover how the software the modding communities are using have shaped the gaming culture as a more collaborative space, allowing to help build the worlds they and others participate in even outside of the game studio’s original scope. For this project, I will be using the Dragon Age Origins Toolset offered by the developer, Bioware, on their website to create my own mod for the game. Bioware explains that they allow players to use their toolset for free as a way to engage with the game and other players on a level beyond playing: “Create your own add-ons to extend the main campaign in new directions; Tell stand-alone stories in the Dragon Age setting or in a setting of your own devising; Share resources with other modders to enhance each others’ works; and Look ‘under the hood’ to see how memorable moments in Dragon Age were done.” As this is my first time attempting to mod, everything is going to be new in regards to my learning how to maneuver within the technology/software. Initially, a majority of my time will mostly likely be spent looking through websites like Nexus Wiki’s section on “Using Dragon Age Mods for Dummies” and Nexus Mods Dragon Age, and a forum on Reddit about how to mod specifically with the Dragon Age Origins Toolset. Other gamers, along with the official wiki tutorials provided by Bioware, are going to be my greatest asset in learning how to mod and then learning how to mod something that is playable for my peers, as they are used to muddling through the technology and creating their own add-ons outside of the official toolsets. Since I am more of a visual learner, YouTube is also going to be another source of how-to guides/references (like the video I have provided below) as well as ideas of completed projects (also shown below). Overall, I am really excited to get my hands dirty with this project because modding is something I have always wanted to try (it feels a bit like writing fanfiction, but works on a more interactive level because other players could potentially take the mod and add it into their actual gameplay), but have never given myself the time to sit down and try. Coding and working with computer software beyond the basic applications is not something that comes naturally to me since, while growing up and even now, I would rather play with a finished product than attempt to figure out algorithms and the mechanical workings of interfaces. This project, if I can pull it off, would allow me to “get under the hood,” as Bioware suggested, and see how video games actually work. 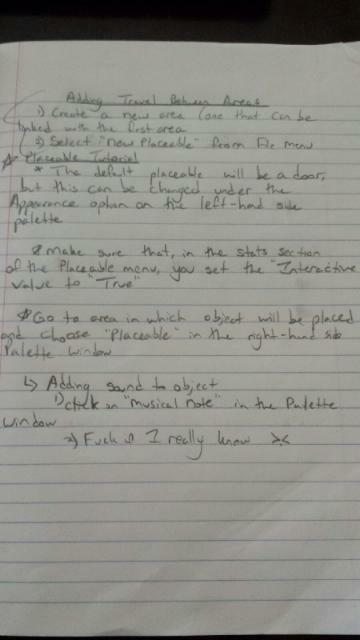 However, it is the coding/algorithm/under the hood aspect of this project that makes me more than a little nervous. Verbal and written communication is what I have spent almost all of my life working to hone, and coding is a language composed of my least favorite things, numbers. I am nervous about this project because I want to do a good job, to show myself that Yes, I can get messy with what is going on beneath the surface of video games and not be overwhelmed by the process. This, in turn, makes me for nervous since having a handle on and familiarity with toolsets tends to be a requirement for the job I want to do, even though that job is to write for video games rather than program them. I understand why knowing how to use a toolset is necessary and rather handy on the job since it gives a writer a way to speak with other members of the development team, but that brings its own pressure of being good at it (not to say completely proficient, but a working understanding). One step at a time, I guess. But how do I frame this in a way that is cohesive with what I have been learning so far (and will continue to learn) this semester? Thinking back over the readings I have done and made notes for, three concepts that inform this project are Tornatzky and Klein’s innovation, Brooke’s invention as proairesis, and Gane and Beer’s take on interactivity. In regards to innovation, this concept really informs what the creators of mods are doing because they are creating additional character designs, extending scenes (such as the game mod I embedded in my Technologies section), correcting glitches that occur in-game, creating a new character class (officially, the game only has three–mage, warrior, and rogue), and other enhancements to gameplay (such as modifying a spell). Most of these mods are add-ons that do not change the game entirely and do not exist as isolated pieces (though creating unique scenes can be isolated), and they work towards improving the gameplay experience. For invention as proairesis, Brooke’s remapping of this particular rhetorical canon is useful because game modding takes one existing text (the game) and allows players to create whole sets of other possibilities that can be added into their games. Moments in the game, then, are not to be seen as resolutions in so much as they become points of departure for modders since every scene, character, class, and spell can be altered to create something new. For example, the mod I have shown above is an extension of what happens in the game, but it is developed to deliver a more poignant moment for the player and her characters. It is a possibility of what could happen in the space where the game’s official path skips over. For my last concept here (there will be plenty of others in the process of the project), Gane and Beer’s take on interactivity is useful not only because video games (like all media) are considered interactive, but because the look to Tanjev Schultz’s understanding of how new media in general is considered interactive: “New media interactivity is, for a start, instantaneous, and tends to work in ‘real-time’. It also, in theory, offers the promise of being more democratic: ‘the formal characteristics of fully interactive communication usually imply more equality of the participants and a greater symmetry of communicative power than one-way communication’” (qtd. in Gane and Beer 95). By allowing their players a chance to create mods through their toolset, Bioware is creating a space in which players are allowed to extend the discourse of the game in a way that does have “greater symmetry of communicative power.” That is not to say, though, that players are equal with the developers since modders must work within the confines of the software (the mods must be compatible with the preexisting coding), but the toolset gives players the chance to create something of their own, however small, and share it with others. So ends this proposal. Image hosted on a Buzzfeed article. Bioware. “Career Search: Assistant Designer.” Electronic Arts Careers, n.d. Web. 02 October 2014. Bioware. 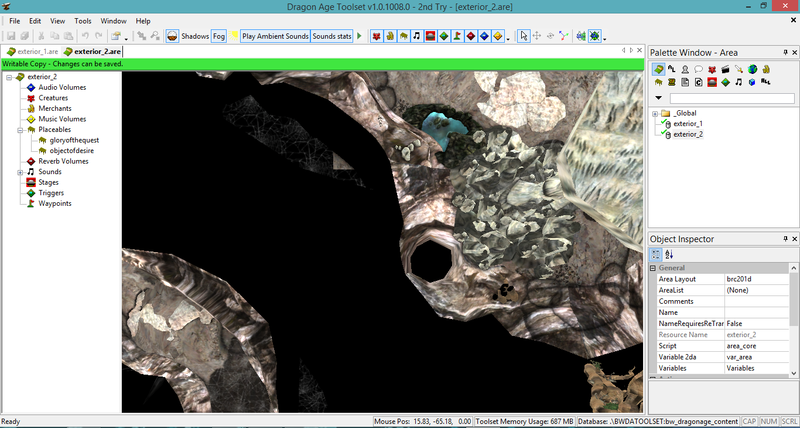 “Dragon Age Origins Toolset.” Bioware Social Network, n.d. Web. 03 Ocober 2014.